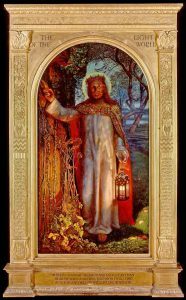 THE LIGHT OF THE WORLD is, according to Wikipedia an allegorical painting by the English Pre-Raphaelite artist William Holman Hunt (1827–1910). It represents the figure of Jesus preparing to knock on an overgrown and long-unopened door, illustrating Revelation 3:20: “Behold, I stand at the door and knock; if any man hear My voice, and open the door, I will come in to him, and will sup with him, and he with Me”. The door in the painting has no handle, and can therefore be opened only from the inside, representing “the obstinately shut mind”, said Hunt who, 50 years after painting it, felt he had to explain its symbolism. The original is variously said to have been painted at night in a makeshift hut at Worcester Park Farm in Surrey, in the garden of the Oxford University Press or even that Hunt found the dawn light he needed outside Bethlehem on one of his visits to the Holy Land. In oil on canvas, it was begun around 1849 and completed in 1853, exhibited at the Royal Academy in 1854 and is now in a side room off the large chapel at Keble College, Oxford. 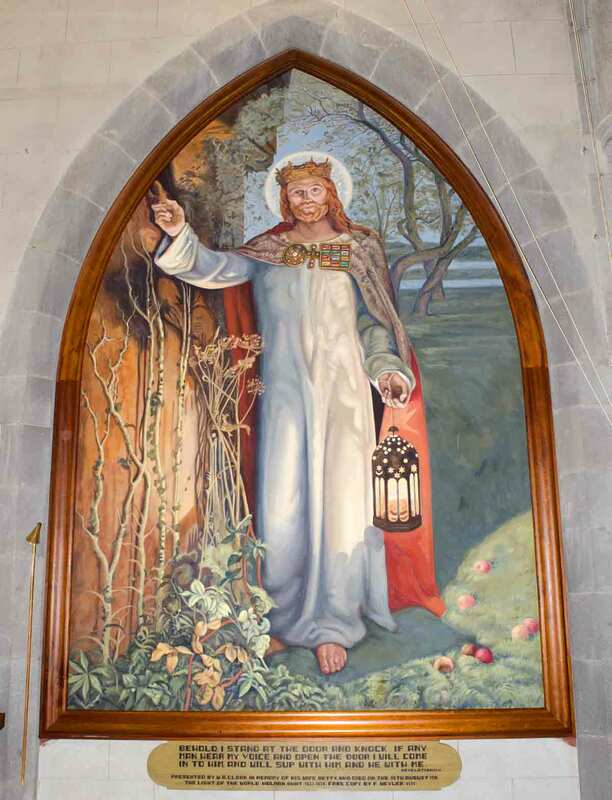 The painting was donated to the college by the widow of Thomas Combe, printer to the University of Oxford, Tractarian and a patron of the Pre-Raphaelites, in the year following his death in 1872 on the understanding that it would hang in the chapel, under construction at the time. The Light of the World painting that hangs in St Paul’s Cathedral. However, the building’s architect William Butterfield was opposed to this and made no provision in his design. When the college’s library opened in 1878 it was placed there, and was moved to its present position only after the addition in 1892–5 of a side chapel to accommodate it. At one time the college charged to view it, which persuaded Hunt toward the end of his life to paint a larger, life-size version, begun around 1900 and completed in 1904. 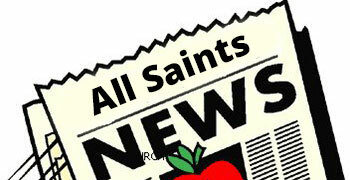 The new version was purchased by ship owner and social reformer Charles Booth and hung in St Paul’s Cathedral, where it was dedicated in 1908 after a 1915–7 world tour in which it drew large crowds. It was claimed that four-fifths of Australia’s population viewed it during its time there. Due to Hunt’s increasing infirmity and glaucoma, he was assisted in the completion of this version by English painter Edward Robert Hughes. Hunt was eventually buried in St Paul’s. A third, smaller version of the painting in pastels was purchased in 1964 and put on display by Manchester City Art Gallery. The painting was the subject of popular devotion in the late Victorian period and inspired several musical works, including Arthur Sullivan’s 1873 oratorio The Light of the World. Engraved reproductions were widely hung in nurseries, schools and church buildings.